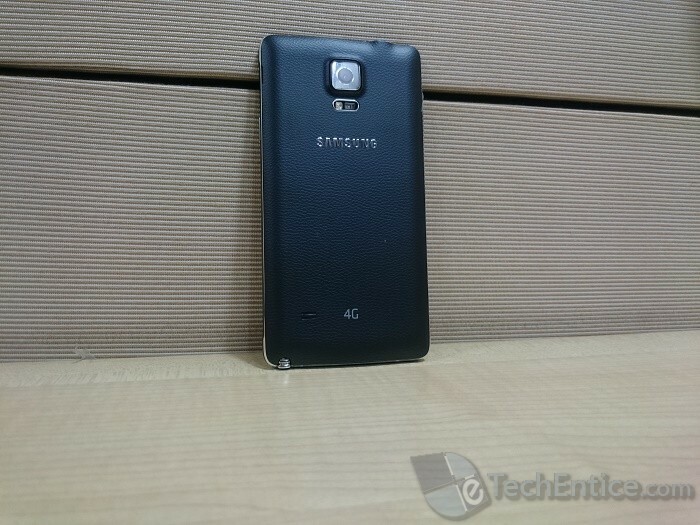 Why Samsung Galaxy Note 4 is an amazing gadget to use? 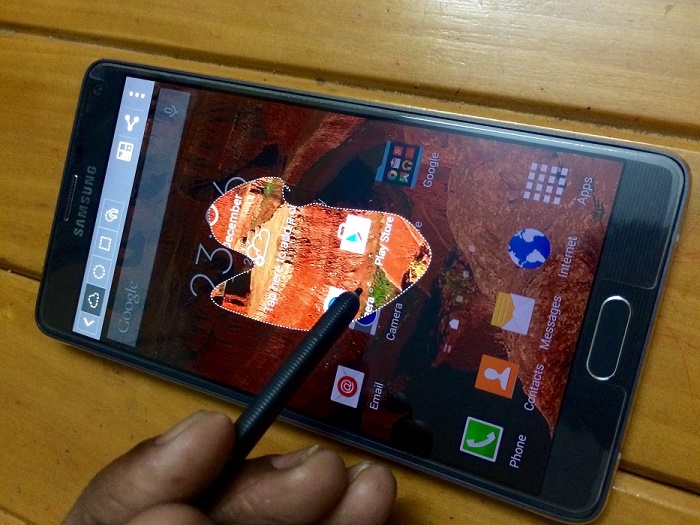 Home > Android > Why Samsung Galaxy Note 4 is an amazing gadget to use? Samsung is the quintessential maker of phablets, tablets and smartphones and Galaxy Note 4 is one of the most coveted devices. 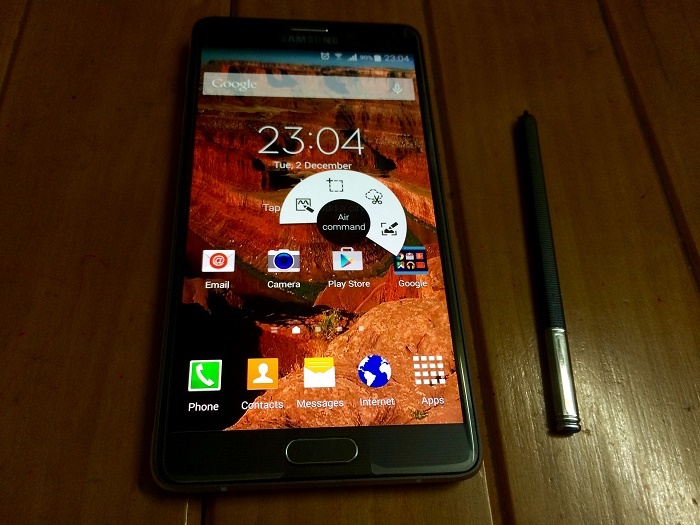 In this article I will tell you all about Note 4. Samsung’s Note devices fell prey of mockery of rivals when they first came to the market as a mammoth screen seemed to be funny and useless. But then users started understanding that it feels great to have a pristine and clear screen with big screen. Hence, a big 5.7″ QUAD HD Super Amoled Display is definitely a plus point. The hue and resolution is more prominent as compared to its predecessors Note 3 and Note 2. Apart from display a large number of new features has been brought in Note 4. The overall design of the outer cover has changed and the device looks different from the previous versions. 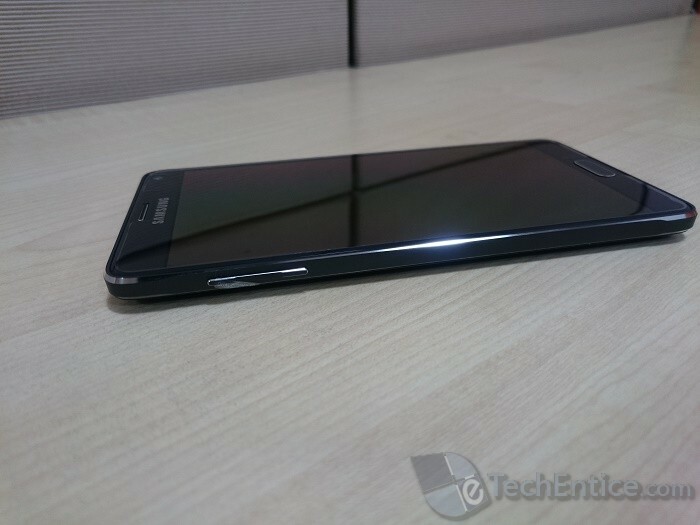 its side are curvy like Note 2 and 3, but the edge is not smooth. It has earned a little height than before thus having a slightly different yet stylish look. Apart from this, the case is now metal body. In all the previous models, we have found plastic cases. Note 2 has the glossy plastic back cover and Note 3 has the matte plastic back cover, similar to that of S5. Samsung has kept the matte look of Note 3 for the superior grip but replaced the material with half polished metal frame. This means more reliable and sturdy. Galaxy Note 4 weighs 176 grams whereas Note 3 weighed 168g. This implies Note 4 is a tad bit heavier than Note 3. Screen is a humongous 5.7 inch QUAD HD Super Amoled Display. Even though the screen size has not been enlarged any more, but the inbuilt specs have been revamped thus giving a more clear and vibrant colors with a resolution of 2560×1440 with 515 pixels per inch which is definitely a treat to eyes. Even some of the Samsung Smart TV models have resolution of 1080p, which means 1920×1080. Apart from this, color regulation in Galaxy Note 4 is possible for the Display menu. The three modes are respectively Adaptive, Photo, and Basic. So we can imagine how powerful the resolution is. The Corning Gorilla Glass 3 ensures enhanced durability. Now coming to the internal hardwares. Note 4 is available in two versions in terms of processor- the Snapdragon 805 processor and the Exynos processor. The version with Snapdragon 805 is teamed up with Adreno 420 and the one with Exynos Processor has Mali T-760. We have reviewed here the one running the first processor, Snapdragon 805 Quad Core processor with processor speed of 2.7 GHz. The other version has a processor speed of 1.9 GHz. Storage capacity includes a large 3 GB RAM along with an in-built 32GB Internal memory which is expandable upto 128GB via Micro SD card. The S pen sensitivity has been increased two times which assures you giving a smoother experience. The 15g weighing light S Pen has specs of Hovering 15 mm and Pressure level 2,048. The S Pen can write flawlessly and perform more functions. The device includes Gesture, Accelerometer, Geo-magnetic, Gyroscope, RGB ambient light, Proximity, Barometer, Hall Sensor, Finger Scanner, UV, HRM etc. Battery capacity is 3220 mAh which ensures Fast Charging. Note 3 had Li-Ion 3200 mAh battery. So battery is also ameliorated to some extent. The device comes up with a 16 MP with Smart OIS/ Fast AF, Live HDR(Rich Tone) and a 3.7MP selfie camera wih additional features like F1.9/ Selfie (90º), Wide mode for taking better selfies anyhow. At the back of the camera beside the LED flash, is present the UV sensor to measure the UV radiation of the Sun. Note 4 will come with Android 4.4 Kitkat update from factory. The overall interface will be similar with some tweaks in the operation of the S Pen. For example, a long press of the S Pen on the screen will open an Air Command Menu from which you can select your desired option. After using Note 2, the smoothness of Note 4 S pen has mesmerized me beyond words. Plus the opening of S Notes is much more lucid and easy as compared to previous Notes. Another feature which is new in Galaxy Note 4 is the all enhanced multi window feature. You will be apply to open two windows like floating windows just like we find in Windows OS. This is immensely helpful as you can drag diagonally and place any window and move them accordingly. The flexibility is in such a level that it won’t block any view of you apps, or mails or contact icons. This is all about Samsung Galaxy Note 4. It is available in 4 beautiful colors Frosted white, Charcoal black, Bronze Gold, Blossom Pink. Good Point about the Camera, and don’t forget the Resolution that goes with it. Yes.. The QHD (40% higher than FHD) Super AMOLED Display is just awesome. Humm maybe this is the phone I should be going for, you raised some very interesting points. I’ll give it a thought, that’s for sure! The design of Samsung Galaxy Note 4 is good. Its better battery life than its predecessors, efficient camera etc make it a better option for buying. This new Note can not be rated without comparing it to its closest concurrents. And in that match, the Note is far better than the 6plus. I agree the Galaxy Note 4 is better in my opinion than the iPhone 6 in all aspects. Having used both I find the functionality and all round experience superior. So if you are undecided this article is a useful tool. I am always like to buy new model phone so today i have learned so many things about Galaxy Note 4 which is really encourage me to buy that very soon . Hope it will be an extraordinary phone than others. I would love to have some. But it’s to expensive for me for now. Samsung Galaxy Note 4 has a premium screen with Super AMOLED display.It have advances features even in camera.It provides a new way to take notes.Most advanced feature is S pen.It allow our intuition to use this,for more convenience.It has high recharge capacity. Samsung Galaxy Note 4 has a premium screen with Super AMOLED display.It have advances features even in camera.It provides a new way to take notes.Most advanced feature is S pen.It allow our intuition to use this,for more convenience.It has high recharge capacity.its very easy to operate also. 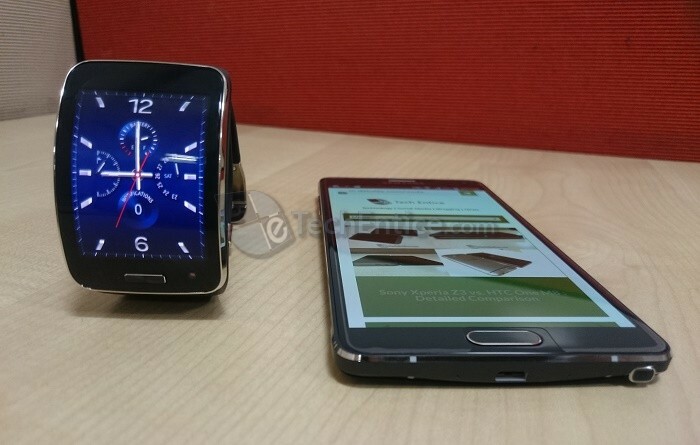 I had my first galaxy note 2 way back 2013 and this will be my next goal for the year of 2015. its an awesome gadget and i like the watch. Galaxy Note 4 is my dream smart phone. I haven’t bought it yet but some of my friend did. And they all say it is the best gadget ever. I hope I will buy one soon. I was eager to buy a mobile with advanced features,after reading this article,I decided to buy Samsung Galaxy Note 4 ,since,it has premium screen with Super AMOLED display.,highly developed camera, S pen,high recharge capacity.and easy operation. A very good and amazing phone. Its the cream of the crop. Camera is awesome and the speed of the cpu is quick. Great overall smartphone. Is one of the best phone for price today.I heard that some people are complaining about the charger, i want to say that itt charges to 80 percent in just one hour. After almost two years it can beat the hell out of any phone in terms of performance and features. I upgraded from a Note 3 which I had for 12 months. It is an awesome device.I like the front camera(3.7MP),it is verry goodfor selfies.I like also the design of the phone,you have a verry good grip.I think this phone is the most performant on the market right now,and if you are looking for the best phone ,you should buy this one. I love this device, it’s the most performant i think ! The design is good and it have a better battery life ! I would love to have some. But it’s to expensive for me for now. I think this phone looks very good. I think it has a lot of useful features. The screen size is big enough to see things quite clearly. I really admire this phone, its software is very reliable and fast. screen resolution is spectacular. I have a Galaxy Note 4 and I can say that it is one of the best phones of today, I never regretted it. Awesome screen resolution, good picture quality (excellent back&front camera definition) and good audio/video quality. I love it! Samsung Galaxy note 4 has a pen and that make you can easily select the desired content of the text, screen and application. Combine all that you choose and share and store all at once. My friend bought Galaxy Note Edge and he is delighted. I hope that I will buy one too. While the screen size is the same as Note 3 at 5.7-inches, Samsung has improved the resolution. The Note 4 comes with a gorgeous super amoled screen with a resolution of 2560 x 1440 pixels. This gives it a pixel density of 515ppi – everything is pin sharp with vivid colors. Oh I love that big screen…screen resolution is really spectacular…and i heard for the highly developed camera..really cool ! second after boot up, but otherwise it’s been phenomenal. Although, the small update that Canada got OTA has caused me an issue. and that solved my problem, so I’m happy as a clam with my phone. has also been quite a bit of fun. Every year Samsung launches a new Note series smartphone and still manages to improve upon its predecessor in multiple ways. The Note 4 is the latest flagship from Samsung and carries forward everything that users love in a Samsung Note while taking care of any gaps in the Note 3. The Note 4 is the second phone from Samsung with a metal body (after the Galaxy Alpha). Compared to the Note 3, the Note 4 is just 0.2mm thicker (8.5mm vs. 8.3mm) and 8 grams heavier (176g vs. 168g) – ..
wow the uv sensor in the back of the camera along with the flash is a very helpful feature in note 4. i don’t think i have noticed such a feature in any of the devices so far. i guess this a new technology and it is supremely delightful as well. Whenever we click photos in the daylight the understanding about the amount of sunlight available is very essential. Always due to our lack of understanding it becomes either very high amount of light or shades appear in the picture. by introducing this feature hope it will change the whole experience. Samsung is probably the best company in smartphones, tablets and phablets and Samsung Galaxy Note 4 is here to remind us.I will buy Samsung Galaxy Note 4 for sure. Maybe Samsung is good company, and maybe they have good smartphones etc, but problem is with the batteries, which don’t last long. I hope this is not going to be the truth with the Note 4. Thank you for this info ! Very nice review of this wonderful phone! In my opinion this phone is one of the best on the square and I’m going to buy it soon! I recommend it to anyone who plans to buy it to read this fantastic review! Well the note is my personal favorite , more than enough for daily activities , the best phone out there when it comes to multitasking ,using the note 4 for multimedia and taking photos has never been better , however the issue with all samsung devices is overheating and battery life . well for the note 4 , it’s my favorite mobile device ever, great for day to day activities , the best when it comes to multitasking ,good for multimedia and taking pics , but the issue with samsung devices is battery life and overheating , but overall there are no competitor for it . I like the way that this article has so many good pictures of very feature that it talk about. It just makes the reader’s job of visualising so easy. I think the feature I like most is the S pen. The camera is exceptional as well. All the technical details cited in this article seem to be accurate. Its a very detailed and good review for anyone who is thinking of buying the Note 4.
well the article is so informative and i was also looking for galaxy note 2 or 3 but reading this article i got many info about note 4 so i wish soon i will buy note 4 and thanks for writing this good article..
a well encouraging article, I have been thinking of a very good and a well structured device to purchase. I never had a better idea until I came across this article. Thanks for the information…. Samsung makes of course really good phonesl but I think that there are few options with better price to performance ratio. But I must admit that all the features of Note 4 really impressed me and if I would to change my phone right now, that phone will be on my personal top in my wishlist. yes samsung galaxy note 4 is undoubtedly an amazing piece of engineering. i recently purchased this device and i dont have any issues with it. i works just as smooth as it should. it is worth its price. but there is one problem with the device, that is its battery life. it dosent lasts for more than 5-6 hours on a heavy day. i wish if samsung could make could battery improvements. i think samsung galaxy note 4 is a awesome phone. it fature is so nice. and now i want to buy this phone because i think it is so enjoyable ……………………..
Hello Guys, I’m not a big fan of samsung , after using samsung galaxy s4. I think samsung is making mobile/tab for only earning money… lots of money. Quality of the products are not very good. But this time, after seeing samsung galaxy note 4 i think its really worth for money. I think this is the best note ever from samsung. samsung galaxy4 is a wonderful phone and it has many good and useful feautres which helps me increasing my bussiness and it works as a smooth and it is not so expensive if we see the feautres of this phone. I thik samsung galaxy 4 is a revolutionary product wich helped and still help too many people around the world. First time i touched this phone i could not believe all the features that includes ! Such a really powerful phone. the best thing i like about Samsung is their user friendly feature. Also, With the best hardware in the market and software that pushes mobile multitasking to the maximum, you can expect tremendous performance from Note 4. I am using Samsung. I think, Samsung is too easy for use. And I read this post. 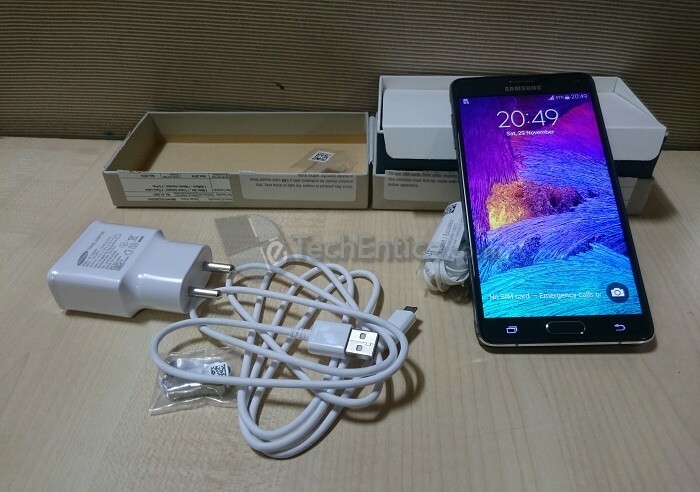 This post have got very informations for Galaxy Note 4. Thank you all informations. I got a galaxy Note 4 and I have always, is a very smart device. I recommand it for every person who love the new technology and simple devices.